The Nifty has remained pretty flat, returning a mere 1.5% since Dec 31, 2015. 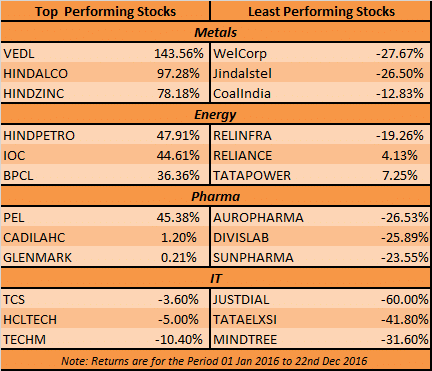 In comparison, sectors such as Metals and Energy have outperformed the Nifty handsomely. Pharma and IT were loss making investments. Nifty Metal gained 43.72%. On top of capital gains the index also delivered 3.75% in dividend yield, thus yielding a total return of 47.47%. 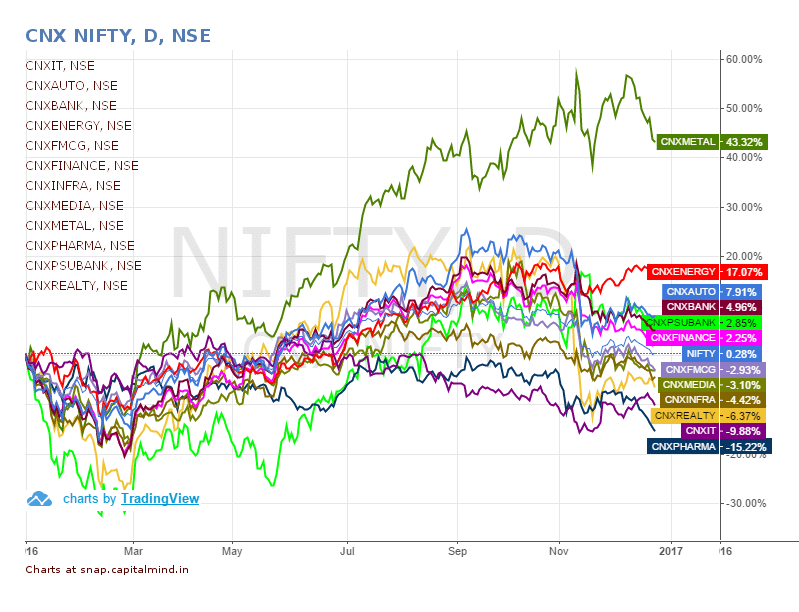 Nifty Pharma has been the worst performer, losing 14.64%. The minimum import price imposed by government has been shielding domestic steel manufacturing companies. Lately, rising global commodity prices of metals has supported the momentum. However, P/E of the metal index is at a high of 40.98, indicating optimistic expectations from investors. With the steel industry being a large chunk of banks’ stressed assets, keep a watch on this in 2017. Nifty Energy delivered 16.73% on capital gains and 1.66% on dividend yields. Petroleum stocks performed well. Cheap international oil prices and higher consumption supported margins of these companies. The index has a low P/E of 11.99. Increasing global crude oil prices might support the oil refining industry but may be a major disruptive force for petroleum sale and distribution companies. Hindustan Petroleum and Indian Oil Corporation have been the best performers in the segment with more than 40% returns. Reliance Infra is the only stock with negative returns in the index. Reliance Industries returned 4.13%. 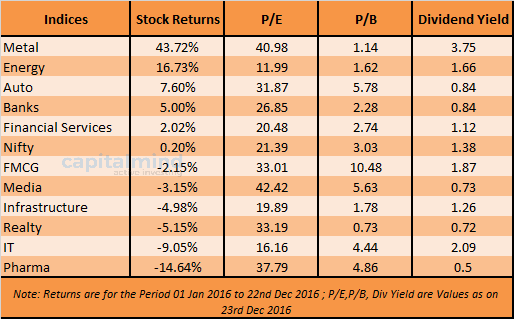 Nifty Pharma, one of the best performing indices until last year, disappointed investors with negative returns of -14.64%. The sector has been witnessing increased USFDA inspections. Sun Pharma’s plant at Halol has remained shut for more than a year now due to lack of FDA clearance. To add to woes, firms supplying drugs to Venezuela have recognized losses due to defaults by their clients. Piramal has done exceedingly well even in these testing times, gaining 45%. Aurobindo, Divis and Sunpharma have fallen more than 25% form the start of the calendar year. Despite the correction, the P/E still stands high at 37.